Malcom Runnalls of Fremantle, Western Australia, has designed this handsome 39-footer specifically for IRC racing on the West Australian coast. The boat is designated as a "cruiser-racer," and I would think that is a way of trying to convince the rating committee that this design deserves full rating credit for its comfy interior. The IRC has not caught on here on the West Coast of the U.S. but it is catching on in East Coast racing circuits. In many ways the basic hull form of the typical new IRC boat is exactly what West Coast designers have been trying to avoid for years. The IRC likes heavy boats with the emphasis on upwind power and speed. Western U.S. designers have favored light boats with the emphasis on blinding off-the-wind speed. But in most areas the IRC filled a void left by the IMS rule and fleets developed quickly. Some design offices also do not like the range of subjective factors the IRC uses to evaluate hull form, rig type and interiors. Designers like specific targets. The IRC works at being a secretive rule so that designers are always working to some extent blind in terms of the design's ultimate rating. The final rating of an IRC boat is in the hands of the rules committee and we do not have an IRC rules committee in the U.S. This is critical in my opinion. That said, the IRC is hugely popular in Europe and has become the grand prix racing class, and I can't see that changing soon. Rating rules have traditionally been great fodder for designer debates. The hull form shows about three inches of bow overhang and 5 feet, 8 inches of overhang aft. The IRC measures a static DWL, and this design shows that the designer has made the decision that overhang aft is far more important to increasing sailing length than overhang forward. Look around at today's fast boats and you will see that there seems to be no argument there. The D/L of this design is 141, a bit heavy for a racing boat but true to IRC type. The L/B is 3.47 and this is on the narrow side, but again true to IRC type. The IRC has not been measuring stability so this design has a 52-percent ballast-to-displacement ratio with a 6,160-pound bulb on the end of a fin with a draft of 8 feet, 6 inches. The prime target for an IRC boat is upwind power, and if the draft and B/D were not enough this design also has water ballast tanks centered around station No. 5, i.e. the linear middle of the boat. The rudder planform is approximately 62 percent that of the keel fin planform. The bow of this design shows a half-angle of entry of 15 degrees. The interior has V-berths forward, quarterberths aft, a small but adequate galley to port and icebox to starboard. The settee berths include seat backs that fold up to form upper berths. The nav station is tucked under the forward end of the big cockpit, aft of the companionway and faces aft. The SA/D of the Runnalls 39 is 29.09. That's plenty of horsepower, especially if you consider "medium" air in Perth is probably 25 knots. 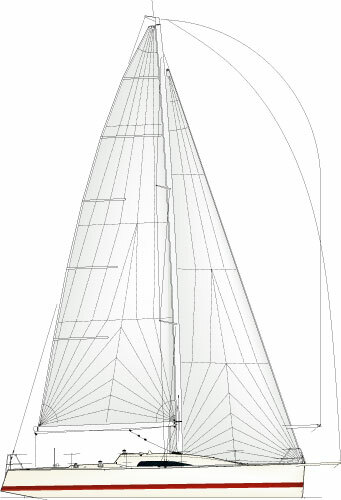 There is a long, fixed bowsprit for an asymmetric sail, but a traditional spinnaker pole is also shown but with less SPL (spinnaker pole length) than indicated by the sprit. Both types of chutes are flown from the masthead. Spreaders on this carbon rig are swept 20 degrees. The IRC does not treat jib overlap kindly, so this design shows what looks like a 100-percent LP jib. The sheeting angle is 11 degrees to a short track. Two of the most interesting features of this design are the tacking wheel that pivots from side to side as the helmsman requires and the retractable drivetrain that pivots up pocketknife style into the hull to leave the hull flush. The hull is built with E-glass and wet laid up epoxy over a Corecell foam core. There are unidirectional carbon caps in select high load areas. It looks like a great design to me. Even under PHRF I can imagine this boat being a lot of fun and effective to race. LOA 39'4"; LWL 33'5"; Beam 11'4"; Draft 8'6"; Displacement 11,792 lbs. ; Ballast 6,160 lbs. ; Sail area 968 sq. ft.; SA/D 29.09; D/L 141; L/B 3.47; Auxiliary Lombardi 30-hp; Fuel 20 gals. ; Water 53 gals. Runnalls Design, 141 Petra St., East Fremantle, Western Australia 6158, 61-8-9339-0441, www.runnallsdesign.com.